Hi everyone! In case you don’t follow my Instagram or Facebook, our little one came into the world on Friday, August 3, 2018! 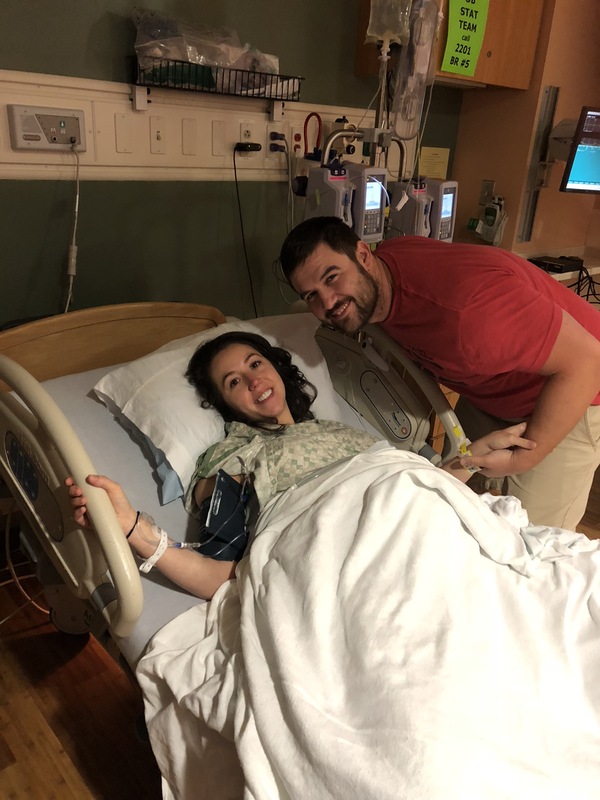 Georgia Grace Hoffer wanted to come three weeks early! She is now two weeks old and our entire lives. No, I didn’t go into labor. I was actually working on a blog that Thursday morning (to be posted on Friday) and this is exactly what I wrote… ” Hi friends! I’ve made it to full term. Holy moly. 37 weeks today!”. After I wrote that line my stomach churned. I was watching the Bachelorette and I felt like something was off. Why hadn’t I felt her move yet? I normally felt her move like CRAZY. In fact, two nights before I couldn’t sleep because she was moving so much. I had my small cup of coffee like always and normally that gets her going. I ate a little something and still nothing. I went upstairs and laid on the bed, tossing and turning to each side in full panic. I’m not sure panic exactly describes what I felt. The dogs were hiding because I was in hysterics. I did all the tricks I do at work. Something ice cold, something sugary, switching positions, even shaking my belly around for a response. I felt the smallest little nudge, relief went through me, but I still wasn’t convinced. I called Tony to come home, something I’ve never done in the years we’ve been together. I called my mom next and hearing her voice helped immensely. They both probably drove 100 miles per hour to get to me. That day I was actually scheduled for a growth sonogram at my doctors office and my regular 36 week check up. It wasn’t until 3pm and by this time it was only 10am. We couldn’t wait. I was on the couch when Tony got home and I actually was feeling more movement. Remember, I do this for a living and see quite a bit of decreased fetal movement. Babies have sleep cycles and need sleep just like we do! I looked at my mom and Tony thinking should I just wait it out? Am I being paranoid again? When you don’t feel your baby move minutes seem like HOURS, like an eternity! Tony said no grab your stuff, we are going to the hospital. I agreed and knew it would be better to go to my work and be put on the monitor. I was feeling her move some now, and seeing the fetal strip was going to put my mind at ease until our appointment later. On the ride there I called my doctor (who is a saint, might I add) and she said absolutely not, come to the office now, we will do a biophysical profile along with your growth sonogram and then we will do your appointment right after. I got there in tears, feeling all the nerves and as soon as they saw the heart beat relief FLOODED through Tony and I. My midwife (another saint!) was at the bedside clenching my hand, while the wonderful sonographer showed Tony and I that her heart beat was strong. That feeling that washed through both of us is something I will never forget for the rest of my life. Over the past few weeks as my due date was approaching, I had severe fears of something terrible happening. The more pregnant I got, the more anxiety I had over it. People often think as a labor and delivery PA, that my job is all rainbows and unicorns. While some of it is, sometimes they are the hardest moments of my life. Unfortunately, those hard moments are the ones I remember most. Giving people terrible news, being the first person that responds to the emergency that happens in triage, and informing them of loss. The absolute worse part of my job is telling someone they are about to lose their baby, or they already have. I pray for those I’ve treated, and I prayed every single night that Georgia would be born full term, with a strong heart beat and healthy. As the sonogram continued I looked at the screen and remember tilting my head looking at the black space around her. The black space is amniotic fluid, and I thought to myself “that doesn’t look like much, but I’m possibly over thinking this because I’m a wreck”. A few minutes later my midwife said is her fluid low? Bingo. It was low. Part of the biophysical profile is measurement of amniotic fluid. They also look at baby girls breathing, her movement, and her muscle tone. Well Georgia only wanted to breathe, because she didn’t move at all and failed on tone as well. I wasn’t imagining it, I knew something was off. She scored a whopping 2 out of 8- automatic fail. And I’m so glad we listened to our gut and came to the hospital. I started crying and looked at my midwife, then at Tony because I knew what all of this meant. I said out loud “Am I having a baby?”. She said yes, you are having a baby. Induction at 36 weeks and 6 days was not in the plan, but babies make their own rules. I actually delivered her at 37 weeks at 6:36 am. I plan on telling the rest of my “birth story” later on, but wanted to start at the beginning. It was a long story to get to the point, but any moms out there I beg you to trust your gut. You know when your body feels off, you know when you feel a change! I do not let my mind go to the “what if” place, because I have a beautiful baby girl at home right now. I thank God for a loving husband who rushed to be at my side, and parents/family/friends (on both sides) who prayed for a safe arrival of baby girl. I thank God for placing me in an amazing OB practice, with wonderful physicians, a midwife and staff who all cared about our well being. And I’m so thankful for my amazing coworkers who made such a difference in my care as Georgia came into this world. It’s now 9:14am and my baby is fast asleep upstairs with her Daddy. These next few weeks I’ll try to update when I can, but my focus will be on our family. Thank you to everyone who wished us well and congratulated us on becoming parents to the most perfect gift we could ever receive. We love you all!